With over 40 years’ experience, Tom Parker Ltd is a leading distributor of pneumatic and hydraulic products and has announced that it has secured an exclusive UK distributorship with US company, FasTest. 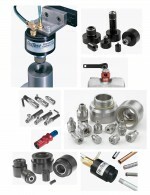 Since 1985, FasTest has manufactured a wide range of quick test connectors and valves, designed for the industrial manufacturing, HVAC-R and compressed gas industries. testing and provide fast, leak-free connections for testing vacuum and pressure applications, fluid filling and flushing. The connectors, suitable for use with air, gas or liquid, are manufactured with a superior performance seal material and are highly adaptable for pick and place robotic systems. Another of FasTest’s key product lines, the TwistMate Series, provides easy connection of internal and external threads.